Right-click anywhere in the Autotrader™ grid to access the context menu. You successfully opened the Profile Setup Page. Use the Profile Setup Page to define the trading parameters Autotrader uses to submit orders to the market. Parameters include trading specifications (Bid/Ask prices, quantities, and offsets), quoting limits, and account information. Profiles Box: This box lists the profiles you create. These profiles contain the trading parameters you configure in the Trading Parameters box. 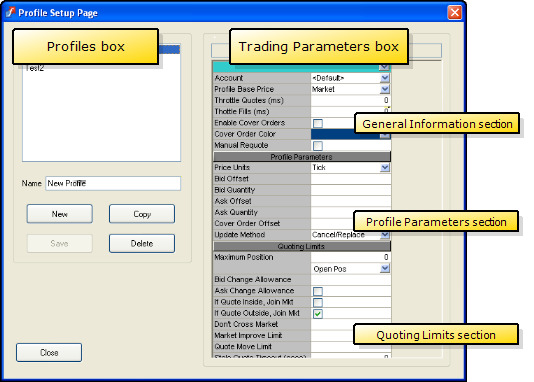 Trading Parameters Box: This box contains the trading parameters that make up a profile. The trading parameters tell Autotrader how and when to submit orders and interact with the market.